Clinical research, recently conducted in one of the most polluted regions of China have shown that daily consumption of half a cup of broccoli sprouts juice significantly increases the excretion of benzene (well-known carcinogen) and acrolein (lungs' irritant) out of the body. The study results were published in the Cancer Prevention Research journal. According to the World Health Organization (WHO), air pollution, which is considered as the main cause of death of seven million people worldwide each year, has reached a dangerous level in many areas of China over the past few years. Moreover, the International Agency for Research on Cancer (IARC) classified air pollution and its suspended solids as carcinogenic to humans in 2013. It is already known that a diet rich in vegetables of the cabbage family (Brassicaceae), such as broccoli, cauliflower, watercress, white cabbage and cauliflower may reduce the risk of chronic degenerative diseases, including cancer. At the same time, research in China showed that broccoli is a source of Glucoraphanin, which turns into Sulforaphane and increases the production of enzymes. The enzymes for their part increase the body's ability to rid the cells of these types of pollutants. A 12-week scientific research of the scientists from the Johns Hopkins Bloomberg School of Public Health brought together 291 people from Jiangsu Province - one of the most polluted areas of China, located approximately 80 kilometers north of Shanghai. The test participants, whose average age was 53 years old, consumed a drink offered by the researchers daily. The control group was offered water and pineapple and lime juices, while the experimental group consumed the same drinks together with dissolved broccoli powder containing Sulforaphane and Glucoraphanin. Researchers found that among those who took broccoli powder with the drink, excretion of benzene increased by 61 percent. Moreover, the level of excretion of acrolein was also increased by 23 percent during the study period. "This study points to a frugal, simple, and safe means that can be taken by individuals to possibly reduce some of the long-term health risks associated with air pollution," notes co-author Thomas Kensler, professor of toxicological science at the Bloomberg School. More clinical tests, to evaluate optimal dosage and frequency of the broccoli sprout beverage for preventing disease, are planned in the same general region of China. Broccoli is very useful. Moreover, the vegetable itself is easily available - nothing prevents us to have access to it. A range of tasty and healthy dishes can be cooked by broccoli. Despite its "modernity" and refinement, broccoli was known in ancient Rome. From there it spread to other countries of Europe and also around the world, and became especially popular in France and Italy. However, in America, broccoli has taken root not at once - local chefs rated it excellent properties only at the beginning of the last century. Its composition is very rich in nutrients; it contains more protein than any other cabbage. In turn, its protein has lots of useful amino acids that support the normal operation of the entire body and prevent the development of many diseases, particularly atherosclerosis. Nutritional properties of broccoli's proteins can be compared with meat proteins, for example, beef, or chicken eggs. Among the plants, it could be compared with asparagus, potatoes, sweet corn and spinach, but they have still less protein than broccoli. Broccoli can be eaten in many forms, including raw, fried, soar and boiled. In a raw form, it is used in salads, combined with other vegetables. It also serves as a garnish for fish or meat. 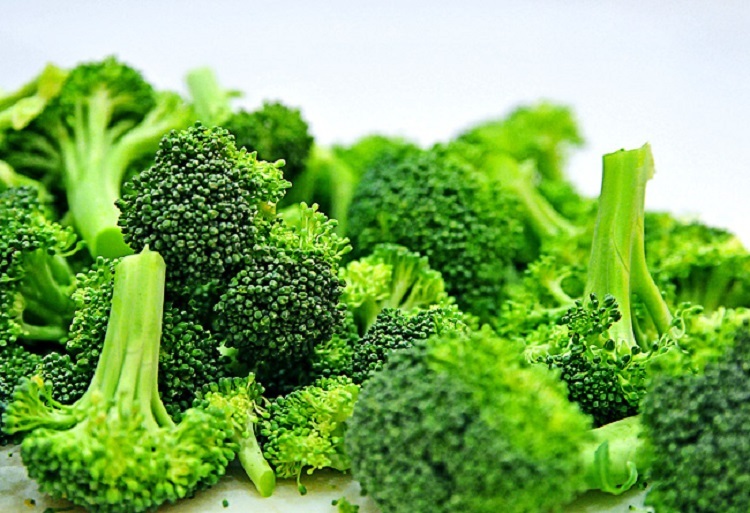 Eating not thermally treated broccoli is the most useful way preserving the maximum number of biologically useful substances in the product, as heat treatment destroys the vitamins and minerals that make up the broccoli, therefore it should be added to dishes just before the end of cooking. Cooked in a microwave oven, it loses a lot more nutrients than processed in other ways. There are no contraindications for using broccoli, however it will not benefit people with individual intolerance of this vegetable. How not to interfere with baby's development?